Quis resistet Sancti Michaelis gladio? One of the most striking things about Rome's churches -- and about Italian churches in general -- is that they are full of representations of the angels. American churches in contrast, especially those built in the last fifty years, are strangely devoid of angelic imagery. In Italian churches there are angels everywhere: all sorts of angels. There are majestic angels of graceful athletic appearance, angels in splendid apparel playing musical instruments, and playful little angels with fat cheeks and chubby legs. In Italian churches, one is always conscious of praising God in conspectu angelorum, “in the sight of the angels” (Ps 137:1). Whenever I have the good fortune to be in Italy, I travel two hours south of Rome to visit my mother’s cousins at my great-grandmother Donna Emma Onoratelli Barbato's ancestral home in the little village of Sepicciano. My grandfather Angelo Barbato spent time there as an infant with his mother, his brother Vincenzo, and his sister Filomena. The shield of the coat of arms, surmounted by the strawberry-leaved diadem of a marchese, is held aloft by two chubby angels -- both of them blissfully naked -- and smiling broadly over the street below! To the right of the front door is a gallery of arches and, over each arch, is a smiling cherubic face. Not two of them are alike. Clearly, this house was built by Christians conscious of the presence of the angels and of their involvement in everyday life. Across from the palazzo adorned with images of the angels stands the family’s private chapel, a church constructed in honour of Saint Michael the Archangel by my ancestor, the Marchese Clemente Onoratelli (1669-1729), and consecrated in 1743. Over the altar hangs a large painting of Saint Michael defeating the devil. According to family legend, Clemente Onoratelli, beset with the vice of gambling (as were so many of the Neapolitan nobility under the Borboni dynasty), had made a pact with the devil so as always to win. After this pact, he found himself anxious, unhappy, and unable to sleep. One night, Saint Michael the Archangel visited him in a dream, saying, “Don Clemente, build a church in my honour, and I will undo this evil pact, and become your protector and the protector of all your family.” Don Clemente rose the next morning and ordered the building of the church of Saint Michael on the slope facing his palace. The church was bombed and very nearly destroyed on October 15, 1943. After the War, it was restored at great cost. Apart from the majestic Saint Michael over the altar, the vaulting of the church’s nave is marked by a series of cherubic heads, all of them smiling, made in the same Baroque style as those of the palazzo. Again, the presence of the angels is something believed, something celebrated, an invisible reality depicted outwardly. I cannot help but question the absence of an angelic iconography in today’s churches. And very rare indeed are homes and even monasteries graced with images of the angels! Out of sight, out of mind? The angels are as present today to us as they were to my Onoratelli ancestors in the village of Sepicciano, but we, sadly, may not be present to them. Are we in danger of forgetting the angels? While the liturgy mentions them repeatedly, all too often we assist at the Sacred Mysteries as if the angels were not there, joining in our praises, observing our attitudes, grieving over lack of zeal, and rejoicing to see us recollected and reverent. Saint Benedict speaks explicitly of the presence of the angels in Chapter 19 of the Rule: “We must therefore consider how we should behave in the sight of the Divine Majesty and his Angels, and as we sing our Psalms let us see to it that our mind is in harmony with our voice” (RB 19:6-7). One thing is certain. We need the angels. God created the angels for the praise of his glory and for our salvation, that is, to participate in his work of bringing us to wholeness, to peace, and to life everlasting in his presence. The angels are sent to us to comfort us in the hour of trial and affliction. Saint Luke, the evangelist most sensitive to angelic interventions, relates that an angel was sent to console Jesus during His agony in the garden (cf. Lk 22:43). The angels are sent to bring us the healing of heavenly medicine, and the brightness of God’s deifying light. The angels are sent before every advent of the Word, to dispose our hearts and unstop our ears. The angels are sent before Christ, our Priest and our Victim, present in the offering of His Body and of His Blood. The angels are sent to bear our prayers up to heaven, and to descend to us, laden with heavenly blessings. The angels protect us in all our ways. They do all of these things gladly, joyfully, and unhesitatingly in obedience to the command of God. We are in great need of angelic assistance. We need the comfort of their presence, the healing ministry of their hands, and the beauty of the praise that ceaselessly they offer God. While we may not have smiling angelic faces on the outer walls of our homes, we do have today’s feast and the daily celebration of the Sacred Liturgy to remind us that angels, unlike us, never forget. May they hold us in their prayer today and cover us with their protection. Who, indeed, can withstand the sword of Saint Michael? 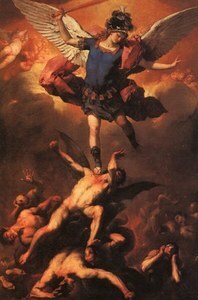 The devotion to Saint Michael the Archangel is very strong in Campania. It would seem that the Basilian Monks, who fled Greece to settle in Campania in the 7th century brought with them the cultus of Saint Michael. 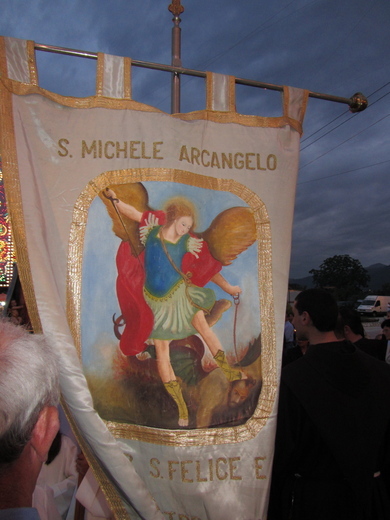 During the procession of the Madonna del Bagno, one of the faithful carried this banner. 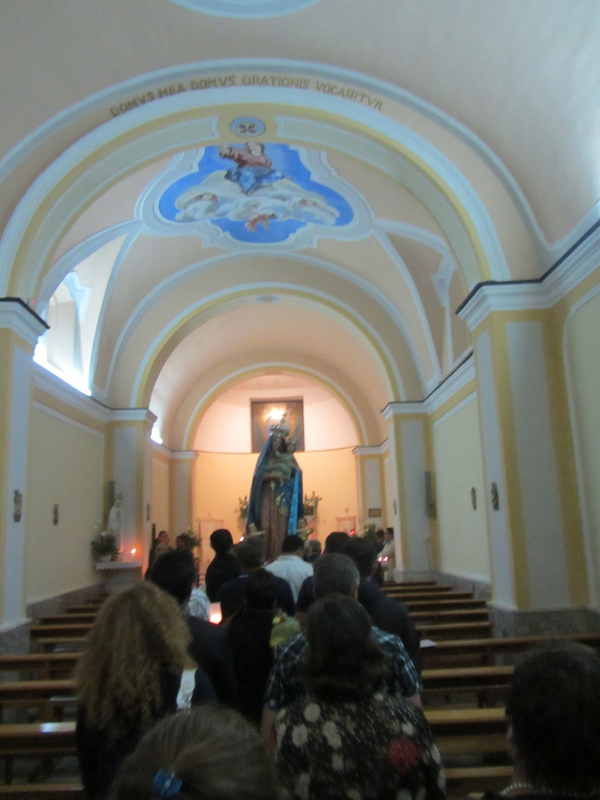 Last night's festivities in honour of la Madonna del Bagno began with Holy Mass at 7:00 p.m. The Father Guardian of the Franciscan Solitude of San Pasquale was present together with the assistant Maestro dei Novizii and three fine novices. 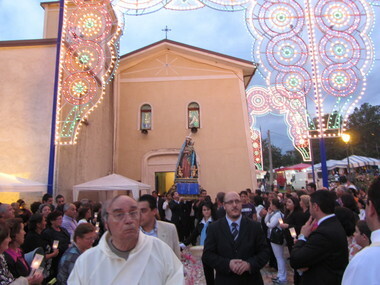 The little shrine church was absolutely full, with the overflow standing in the piazza outside. 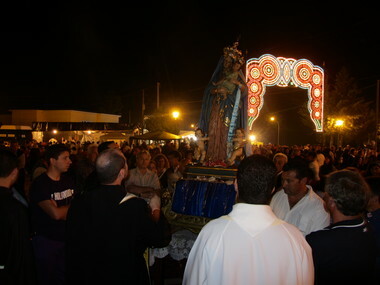 The procession with the statue of the Madonna del Bagno followed. A group of stalwarts carried the statue of the Madonna, crowned (together with the Bambino Gesù in her embrace), and clothed in a veil of blue silk with golden stars embroidered over it. A brass band began to play and a volley of fire works announced the arrival of the Madonna in the piazza. 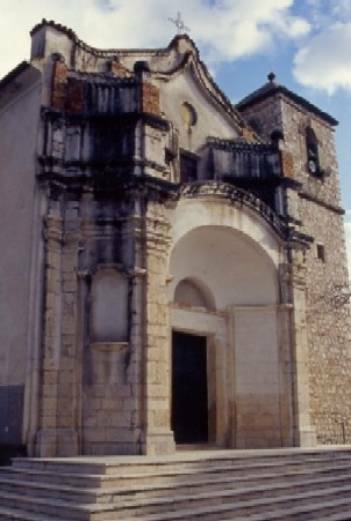 The devotion to the Madonna del Bagno in Gioia Sannitica grew up around a little church adjacent to a hermitage (there are many of these in Southern Italy) built in about the year 1700. There are documents revealing that the church and hermitage were constructed at the expense of the faithful in the place where, according to local tradition, shepherds found an image of the Madonna on canvas in a well. The well, still producing fresh water, is present near the church. The miraculous image is preserved in a frame of carved stone in the apse of the church. The feast of this particular Madonna coincides with the festival of the Ascension. It is customary for the faithful to enter the church and make their way on their knees to the altar of the Madonna, where they wipe their faces with a towel that has been passed several times over the miraculous image. 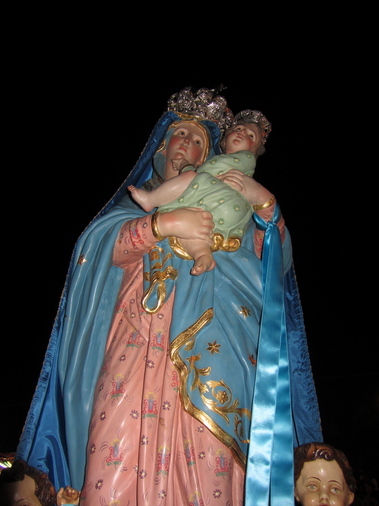 Again, according to the local tradition, the finding of the image of the Madonna was the occasion of numerous miracles. Many persons stricken by leprosy and other diseases were cured after having been washed in water from the well. The curious title, Madonna del Bagno, meaning "Our Lady of the Bath," is related to these prodigies. The church itself is a temple devoid of any particular artistic interest. It has a single nave; the ceiling is adorned with paintings of the Madonna. There are many ex-votos, including offerings of gold and jewelry, that bear witness to the graces received. A crowned statue representing the Madonna of the original image on canvas is enthroned above the altar. Emmigrants from Gioia all over the world and, in particular, in and around New Haven, Connecticut, remain attached to the devotion to the Madonna del Bagno, and still send their offerings to contribute to the annual feast. The sanctuary of the Madonna del Bagno remains a holy place where the Mother of God makes her presence known, touching hearts, bringing healing to souls and bodies, reconciling sinners to her Divine Son, and uniting families in the bonds of a common faith. 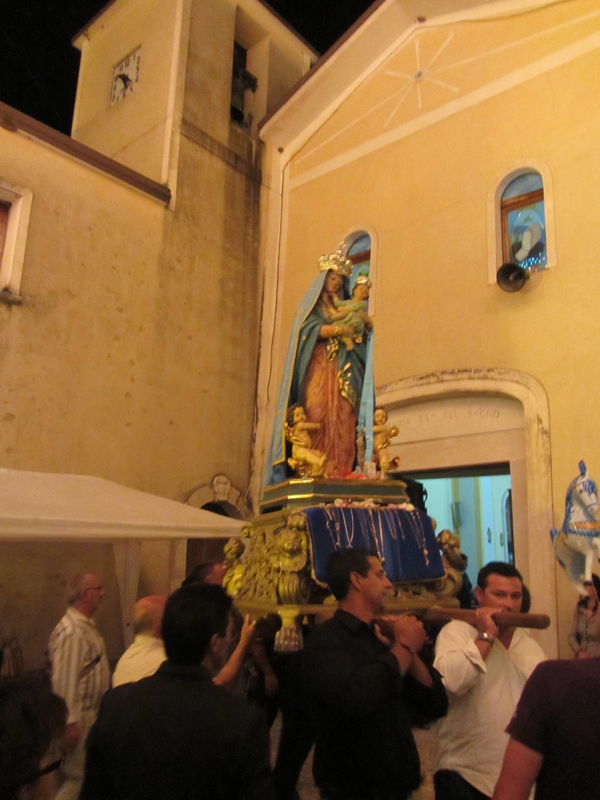 Last night, a number of offerings of gold and jewelry were pinned to a blue cushion at the Madonna's feet. Women and children threw handfuls of rose petals at the statue as the Madonna passed. There were several resting places during the procession, each one marked by an altarino constructed and decorated by a family. At each of these stations, a priest led a decade of the Rosary and invocations to the Mother of God for particular intentions. The procession wound its way all through the countryside, past vineyards, fields, olive groves, and grazing cattle. At various poInts along the way the faithful had prepared carpets of flower petals artistically arranged to form the monongram of the Ave Maria, a heart, a crown, or other Marian symbols. Only those bearing the sacred image of Madonna could walk over these floral carpets of devotion. 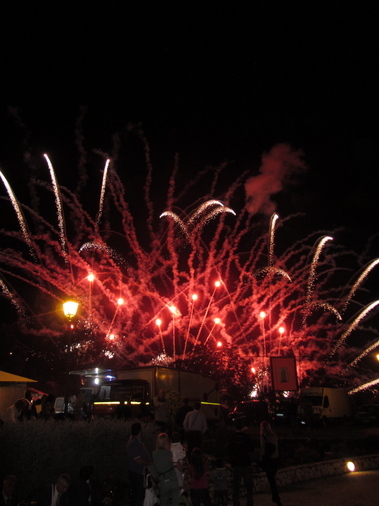 The phenomenal display of fireworks at the end of the procession was also a tribute of love and devotion to the Madonna. The statue was set on a base facing the fireworks display so that the Madonna could enjoy it, as Mother and Queen, in the midst of her children. 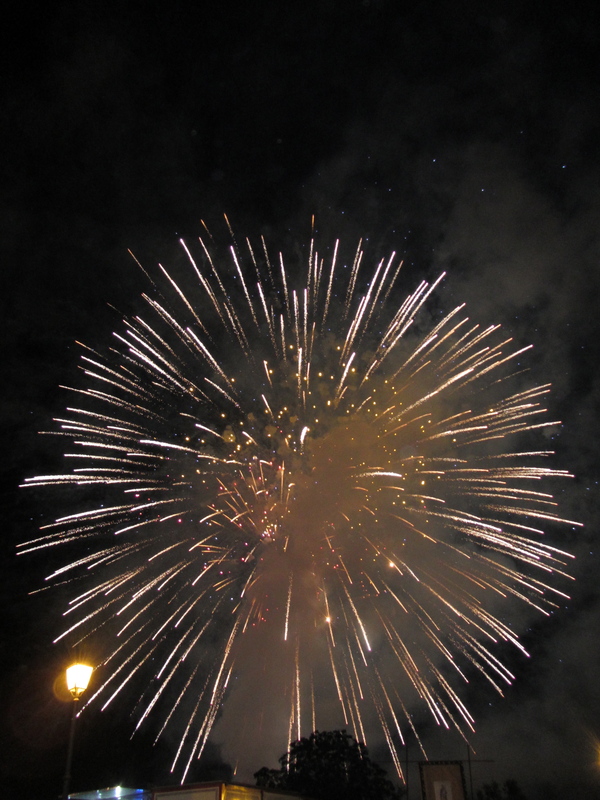 At the end of the fireworks display, I was given the very great honour of offering the final incensation to the Madonna. The photograph of this is very dark. It was, of course, well after 11:00 p.m.
During the procession the brass band played the popular hymn attributed to Saint Alfonso Maria de Liguori, Evviva Maria. You can listen to it here. notte e giorno penso a Te. night and day I think of thee. and for He who created her. We will cry: Hurrah for Mary! and long live her who saved us. Will will cry: Hurrah for Mary! Long may she live who saved us. June 2nd is the feast of Saint Marcellino, priest and martyr, the very one named in the Roman Canon. 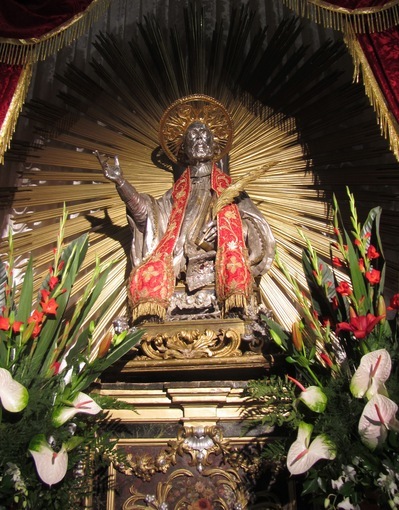 San Marcellino fills Piedimonte d'Alife with the most glorious sights and sounds, and this for nine days, culminating on June 2nd, with the Solemn Mass, Procession, and return of his statue to its niche. I took this photograph this morning after Pontifical High Mass in the Church of San Marcellino. Note that the saint, holding the palm of martyrdom and the Book of the Gospels, is vested in a cotta and red baroque stole. By means of his image the saint himself becomes present in the midst of the people who love him and implore his protection. behold us, humbly prostrate at thy feet. Full of confidence, we have recourse to thee. and all our ecclesial community. that we all profess. Amen. Returning to Sepicciano, where the church bells ring out the quarter hour and the parish church is truly the heart of the village; where the presence of the Mother of God, of the angels and of the saints, is inextricably bound up with every moment of daily life; where to be a human person is to be un cristiano; where people enjoy a simple familiarity in the house of God without any loss of the awe that the Thrice-Holy Presence of the Divine Majesty inspires -- all of these things convince me that while the Catholic faith generates culture and gives shape to all of life, that same Catholic culture is indispensable to a community's spiritual health and growth in the Faith. Here, even those who do not regularly practice the Faith are steeped in it and would never think of denying it. So much of life happens out of doors here. Boys kick a ball around the little piaza in front of the church. Old ladies sit on their bench nearby, exchanging news and greeting passers-by. The parish priest drives by -- fully vested -- on his way to do Paschal house blessings, accompanied by a server! Just inside the vestibule of the church is a plan for the elaboration of a new community garden over which a recently commissioned statue of Saint Padre Pio will preside. In the evening nearly everyone in the village is outside walking (la passeggiata), talking, living the "community" that American Catholics find so elusive and yet so fascinating. This is a culture that Protestantism could never have produced. This is also, I fear, something that Suburban American Catholicism with its parking lots and programs can never achieve. Formerly, when there were still urban neighbourhoods held together by a parish church, particularly if the the parish church had an ethnic identity, there remained something of a Catholic culture. I can only envision the Church of tomorrow in terms of communities that will have embraced a truly Catholic culture in all its dimensions. Quite possibly this will mean the relocation of families around a monastery or the conscious rebuilding of neighbourhoods around a parish church. You have come to this splendid basilica -- a place where spirituality and art come together in a centuries-old union -- to share an intense moment of prayer, by which we entrust to the maternal protection of Mary, Mater Unitatis, the whole Italian nation, 150 years after the political union of the country. It is significant that this initiative was prepared by similar meetings in the dioceses: also in this way you express the solicitude of the Church in making herself close to the destiny of this beloved nation. 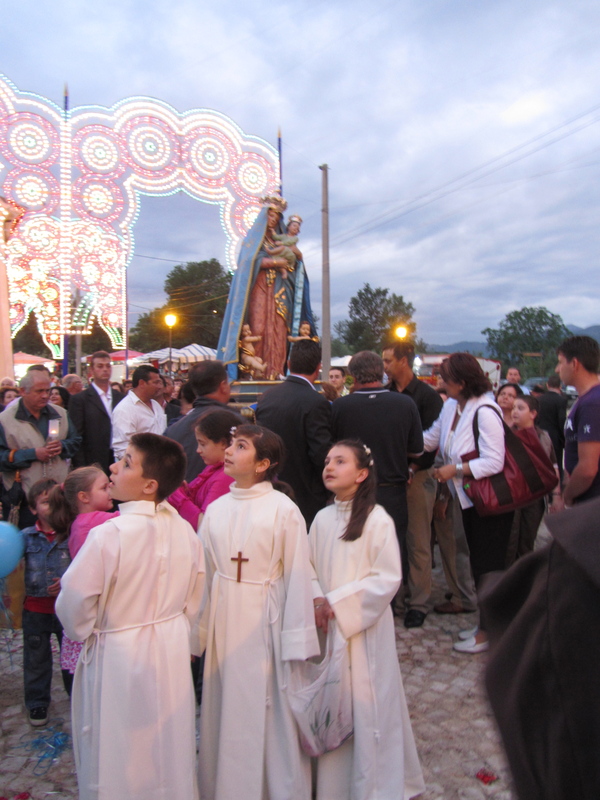 We, in turn, feel in communion with every community, including the smallest, in which the tradition of dedicating May to Marian devotion is alive. This tradition is expressed in many signs: shrines, chapels, works of art and, above all, in the prayer of the holy rosary, with which the People of God give thanks for the good they receive incessantly from the Lord, through the intercession of Mary Most Holy, and pray to her for their many needs. Prayer -- which has its summit in the liturgy, whose form is guarded by the living tradition of the Church -- is always leaving space for God: his action makes us participants in the history of salvation. This afternoon, in particular, in the school of Mary we have been invited to share in Jesus' steps: to go down with him to the Jordan River, so that the Spirit will confirm in us the grace of baptism; to sit at the banquet of Cana, to receive from him the "good wine" of the celebration; to enter the synagogue of Nazareth, as poor ones to whom is addressed the joyful message of the Kingdom of God; also to go up Mount Tabor, to receive the cross in the paschal light; and finally, to participate in the Cenacle in the new and eternal sacrifice that, anticipating the new heavens and the new earth, regenerates the whole of creation. This basilica is the first dedicated to the Virgin Mother of God in the West. On entering it, my thoughts went back to the first day of the year 2000, when Blessed John Paul II opened the Holy Door, entrusting the Jubilee Year to Mary, so that she would watch over the path of all those who acknowledged themselves pilgrims of grace and mercy. We ourselves today do not hesitate to feel like pilgrims, desirous of crossing the threshold of that Most Holy Door that is Christ, and we want to ask the Virgin Mary to support our path and to intercede for us. As he is Son of God, Christ is the form of man: He is man's most profound truth, the sap that gives life to a history that otherwise would be irremediably impaired. Prayer helps us to recognize in him the center of our life, to remain in his presence, to conform our will to his, to do "what he tells us" (John 2:5), certain of his fidelity. This is the essential task of the Church, crowned by him as Mystical Bride, as we contemplate her in the splendor of the apse. Mary constitutes her model: she is the one who presents to us the mirror in which we are invited to recognize our identity. Her life is a call to turn from what we are to hear and accept the Word, being able in faith to proclaim the greatness of the Lord, before which our only possible greatness is that expressed in filial obedience: "Be it done unto me according to thy word" (Luke 1:38). Mary trusted: she is the "blessed one" (cf. Luke 1:42), who is blessed for having believed (cf. Luke 1:45), to the point of having been clothed in Christ to such a degree that she enters in the "seventh day," a participant in God's rest. The dispositions of her heart -- listening, acceptance, humility, fidelity, praise and waiting -- correspond to the interior attitudes and to the gestures that mold Christian life. The Church is nourished by them, conscious that they express what God expects from her. Engraved on the bronze of this basilica's Holy Door is a representation of the Council of Ephesus. The building itself, whose original nucleus dates back to the 5th century, is linked to that ecumenical summit held in the year 431. In Ephesus the united Church defended and confirmed for Mary the title Theotokos, Mother of God: a title with Christological content, which refers to the mystery of the Incarnation and which expresses the unity of the human nature with the divine in the Son. Moreover, it is the person and the experience of Jesus of Nazareth that illumines the Old Testament and Mary's face itself. Understood clearly in her is the unitary design that intertwines the two Testaments. In her personal life is the synthesis of the history of a whole nation, which places the Church in continuity with ancient Israel. Within this perspective individual histories receive meaning, beginning with those of the great women of the Old Covenant, in whose life is represented a humiliated, defeated and deported people. However, they are also the same ones who personify hope; they are the "holy remnant," a sign that God's plan does not remain an abstract idea, but finds correspondence in a pure answer, in a liberty that gives itself without holding anything back, in a yes that is full acceptance and perfect gift. Mary is the highest expression of it. Upon her, Virgin, descends the creative power of the Holy Spirit, the same who "in the beginning" hovered over the shapeless abyss (cf. Genesis 1:1) and thanks to which God called being from nothing; the Spirit gives life to and molds creation. Opening to his action, Mary engenders the Son, the presence of God who comes to inhabit history and opens it to a new and definitive beginning, which is the possibility for every man to be reborn from on high, to live in the will of God and thus to be completely fulfilled. Faith, in fact, is not alienation: the experiences that contaminate man's dignity and the quality of social coexistence [are not the experiences of faith]! In every historical period the encounter with the ever new Word of the Gospel was a source of civilization; it built bridges between peoples and enriched the fabric of our cities, expressing itself in culture, in the arts and, not last, in the thousand forms of charity. No wonder Italy, celebrating the 150 years of its political unity, can be proud of the presence and action of the Church. She does not pursue privileges or desire to substitute the responsibilities of the political institutions; respectful of the legitimate secularity of the state, she is attentive in supporting the fundamental rights of man. Among these are first of all the ethical demands and, therefore, openness to transcendence, which are values that precede any state jurisdiction, inasmuch as they are inscribed in the very nature of the human person. In this perspective, the Church -- strong because of collegial reflection and because of direct experience on the spot -- continues offering her own contribution to the building of the common good, reminding each one of his duty to promote and protect human life in all its phases and to support the family with deeds; the family continues to be, in fact, the first reality in which free and responsible persons can grow, formed in those profound values that open to fraternity and which also enable one to address the adversities of life. Not in the last place, there is today difficulty in accessing full and fitting employment; hence, I join all those who appeal to politics and to the business world to make every effort to surmount the widespread precariousness of labor, which in young people compromises the serenity of a plan for family life, with grave harm to an authentic and harmonious development of society. Dear brothers, the anniversary of the founding event of the unitary state has found you diligent in recalling fragments of a shared memory, and sensible in pointing out the elements of a future perspective. Do not hesitate to stimulate the lay faithful to overcome every spirit of narrow-mindedness, distraction and indifference, and to participate personally in public life. Encourage initiatives of formation inspired in the social doctrine of the Church, so that whoever is called to political and administrative responsibilities is not a victim of the temptation to exploit his position for personal interests or because of thirst for power. Support the vast network of aggregations and associations that promote endeavors of a cultural, social and charitable character. Renew the occasions of encounter, in the sign of reciprocity, between North and South. Help the North to recover the original motivations of that vast cooperative movement of Christian inspiration which animated a culture of solidarity and economic development. Likewise, invite the South to put in circulation for the benefit of all the resources and qualities it possesses and those features of reception and hospitality that characterize it. Continue cultivating a spirit of sincere and loyal cooperation with the state, knowing that this relationship is beneficial both for the Church as well as for the whole country. May your words and action be encouragement and thrust for all those called to manage the complexity that characterizes the present time. It is a time when an appeal arises ever more strongly for solid spiritual references; be able to articulate to all what is peculiar to the Christian experience: God's victory over evil and death, as a horizon that casts a light of hope on the present. Assuming education as the theme of the pastoral commitment of this decade, you wished to express the certainty that Christian existence -- the good life of the Gospel -- is precisely the demonstration of a fulfilled life. On this path you ensure not only a religious and ecclesial but also a social service, contributing to build the city of man. Therefore, courage! Despite all the difficulties, "nothing is impossible for God" (Luke 1:37), for him who continues doing "great things" (Luke 1:49) through all those who, like Mary, are able to give themselves to him with unconditional availability. We place the whole Italian nation under the protection of the Mater Unitatis, so that the Lord will grant it the inestimable gifts of peace and fraternity and, hence, of development in solidarity. May she also help the political forces to live the anniversary of unity as an occasion to reinforce the national bond and to surmount every harmful opposition: may the various and legitimate sensibilities, experiences and perspectives come together again in a wider picture to seek together what truly contributes to the good of the country. May Mary's example open the way to a more just, mature and responsible society, capable of rediscovering the profound values of the human heart. May the Mother of God encourage young people, sustain families, comfort the sick, implore upon each one a renewed effusion of the Spirit, helping us to recognize and also to follow the Lord in this time, who is the true good of life, because he is Life itself. From my heart I bless you and your communities. Liquefatto il sangue di San Gennaro, il vescovo ai napoletani: "A Maronna v'accumpagni"
Il miracolo di San Gennaro si è ripetuto alle 9.45. L'annuncio della liquefazione del sangue nelle ampolle custodite nella Cappella del Duomo di Napoli è arrivato, come da tradizione, dal cardinale arcivescovo della citta' Crescenzio Sepe dall'altare maggiore poco prima dell'inizio della solenne celebrazione eucaristica in occasione della festività del Santo. Secondo testimoni il sangue era già sciolto quando le ampolle sono state tratte dalla cassaforte in cui sono conservate tutto l'anno, evento non frequente. Il sangue del protettore di Napoli, ricorda Sepe, è "seme di speranza: sia sempre per tutti noi il segno che nessuno mai potrà separarci dall'amore di Dio". Il cardinale poi saluta la città con l'augurio di Papa Paolo VI nel 1966, "quando benedi' Napoli - ricorda - come questo sangue ribolle a ogni festa cosi' la fede del popolo di Napoli possa ribollire, rifiorire e affermarsi sempre di più". "A Maronna v'accumpagni", conclude l'arcivescovo Sepe prima di portarele ampolle, percorrendo la navata centrale della cattedrale, fino all'esterno del Duomo per benedire la città e la regione. The 17th century Palazzo Onoratelli was the home of my great–grandmother Emma Onoratelli Barbato. 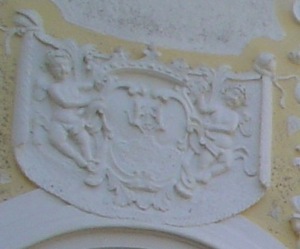 The stucco ornamentation in the baroque style — with smiling angels over the arches — was done by the same artisan who decorated the Palazzo Reale (La Reggia) in Caserta. The setting is almost magical. The palazzo built in the early 1700s has been beautifully restored. The family stemma (coat of arms) is displayed above the main entrance; it bears the sword of Saint Michael and is held aloft by two naked angels. Giovanna de Lellis Piazza, called "Bambolina"
My cousin Carlo de Lellis and his wife Nora invited me to the Onoratelli ancestral home in Sepicciano for the second day of Pasquetta, the Tuesday In Albis. Nora prepared a seven course pranzo that was indescribably delicious. I traveled down from Rome with my cousin Nunzio Onoratelli, his wife Stefania, and Maria Carmen Balestrieri, a dear friend. Joining us in Sepicciano were cousin Giovanna de Lellis, her husband Gabriele Piazza, and her granddaughter Denise. Also invited were the Parish Priest, Don Salvatore, and his assistant from Cameroun, Don Étienne. The parish church of San Michele in Sepicciano was the private chapel of the Onoratelli family until it was given to the municipality to serve as the parish church in 1903. One of the family stories retold at the table was about one of the many priest sons of the family who, in order to save his inheritance from being squandered by his gambling siblings, had a hen and twelve chicks made of pure gold, which he then hid in one of the walls of the palazzo. On his deathbed, the priest was stricken with paralysis and could not tell his nieces and nephews where he had hidden the treasure. After his death, they went to the mason who had sealed up the secret hiding place, only to discover that he too had suffered a stroke and couldn't reveal the hiding place. When Carlo and Nora restored the palazzo twelve years ago they engaged a professional with a metal detector to search for the treasure, but it was never found. Giovanna maintains that it is still somewhere in the walls of the upper stories where the priest son had his rooms. The same rooms are said to be haunted by one of the Marchesi Onoratelli. Cousin Ettore lives in them now. Another joy today! My cousin Carlo de Lellis and Nora, his wife, called from Sepicciano (Piedimonte Matese, Provincia di Caserta) to inform me that their beautiful daughter Sissi will be graduating from Law School in Rome at the end of the month. This lovely photo of Sissi was taken on the occasion of a dinner in Sepicciano. Sissi will practice penal law in Rome before beginning studies for the magistratura. The family is very proud of her. Carlo and Nora have completely restored the main part of the Palazzo Onoratelli built by my enterprising ancestors in the 1600s. A wonderful house with smiling baroque angels adorning the facade! One of the most striking things about Rome’s churches — and about Italian churches in general — is that they are full of representations of the angels. American churches in contrast, especially those built in the last fifty years, are strangely devoid of angelic imagery. In Italian churches there are angels everywhere: all sorts of angels. There are majestic angels of graceful athletic appearance, angels in splendid apparel playing musical instruments, and playful little angels with fat cheeks and chubby legs. In Italian churches, one is always conscious of praising God in conspectu angelorum, “in the sight of the angels” (Ps 137:1). In the Basilica of Santa Croce in Gerusalemme, the angels are associated with the mystery of the Cross. The glorious Cross is depicted throughout the basilica and around it there are always angels — jubilant, praising, adoring, wondering angels! There is a theology in this iconography of the Cross. The mystery of the Cross astonishes even the angels. The mystery of the Cross casts them into a state of unspeakable amazement. They look upon the wood of the Cross and praise the “secret and hidden wisdom of God” (1 Cor 2:7). They look upon the wood of the Cross and adore the Precious Blood that stains it. They look upon the wood of the Cross and confess it as mankind’s only hope. O Crux, ave, spes unica! One cannot visit Jerusalem in Rome, the Basilica of Santa Croce, without realizing that the mystery of the Cross has become the everlasting joy of the angels. Celebrating today's feast of Our Lady of Sorrows, the Addolorata, brought me back to the church of my Italian great–grandmother, Donna Emma Onoratelli, in Sepicciano (Campania). I have had the privilege of celebrating Holy Mass there on numerous occasions. My dear cousins Carlo de Lellis, his wife Nora, and their children Ettore and Sissi now live in the palazzo Onoratelli just a few steps from the church. Whenever I visit them, they insist that I consider it my home too. The church was built in 1742 as a private family chapel by my forbear the Marchese Don Clemente Onoratelli in fulfillment of a vow made to Saint Michael the Archangel. It contains an extraordinarily expressive statue of the Sorrowful Mother commissioned by the family. The ladies of the family considered it an honour to provide the Madonna with an exquisite black dress, mourning veil, and jewelry. In her hand she holds a delicate white handkerchief edged in lace. Unfortunately, I do not have a photograph of the statue. There are still many like it throughout the former Kingdom of Naples, in spite of the fact that unscrupulous antique dealers prize them as collection pieces! From my father's side of the family, the Gilbrides from County Leitrim, I inherited a splendid little Irish prayerbook printed in Middle Abbey Street, Dublin, in 1860. It contains A Devout Exercise in Honour of the Sorrowful Heart of Mary in the form of short meditations on the Seven Sorrows, a Prayer to the Blessed Virgin in her Desolation, and A Short Method of saying the Rosary of the Dolours of the B.V.M. There is evidence of a tradition of devotion to the Mother of Sorrows on both sides of the family tree. I pray that it may continue from generation to generation. "Sow for yourselves righteousness, reap the fruit of steadfast love; break up your fallow ground, for it is time to seek the Lord, that he may come and rain salvation upon you" (Hos 10:12).